Many of us have attempted to cook with cannabis once or twice, and most likely failed. Either we completely missed the mark on dosing, or the dish delivered the desired effects but tasted terrible. Luckily, thanks to legalization and expansive research, cannabis chef-wannabes have more resources than ever before for whipping up truly craveworthy treats. One necessary tool to add to your culinary lit collection? 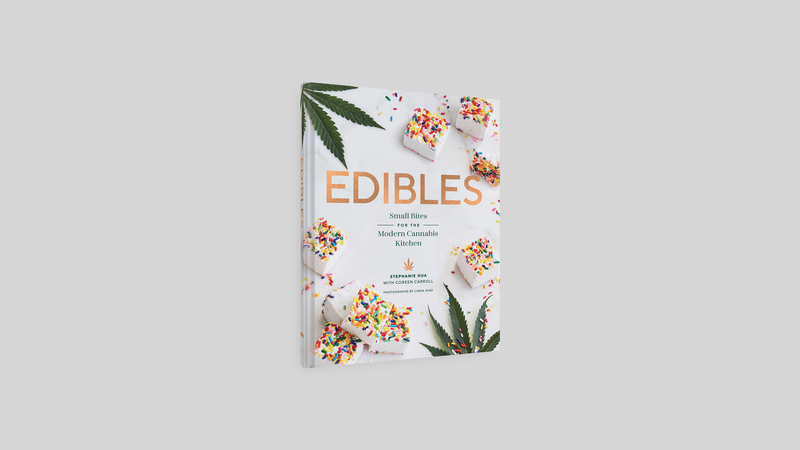 Edibles: Small Bites for the Modern Cannabis Kitchen, a newly released book by cannabis chef Coreen Carroll and food writer Stephanie Hua, the latter of whom also founded Mellow, a gourmet marshmallow edibles brand. The book is filled with low-dose savory snacks, desserts, drinks, and appetizers, all aimed at entertaining with friends without completely knocking them out. The authors encourage us to “think of cannabis as a spice,” and “season with intention.” We talked with the authors about the inspiration for the book, as well as some valuable cannabis cooking tips. How did you become a food writer and chef? Stephanie Hua: I moved from NYC to San Francisco in 2007 and had left behind a job in advertising and marketing. I’ve always loved food and writing, and wanted to see what a career in food writing could look like. I started a food blog, taught myself how to take good food photos, and slowly started building a portfolio. One day I was covering the opening of a new cooking school for a freelance story, and I was sold. I enrolled in culinary school, and after graduating, found myself getting involved in the cannabis industry. That’s when Mellows came to life. Coreen Carroll: Upon moving to San Francisco from Florida in 2012, I went to the San Francisco Cooking School to follow my lifelong dream of being involved in the culinary world. As soon as I graduated, I began creating infused edibles. I knew right away that I did not want to go down the traditional restaurant path, so I was in search of more non-traditional routes. While building our first edibles company, I was also working in the underground pop-up restaurant scene for a well-known chef, and learning how to build and run a kitchen. That’s when the idea for what would eventually become the Cannaisseur Series was born. How would you each describe your relationship to cannabis? Stephanie: I am continuously learning about cannabis, and the more I learn, the more astounded I am by this incredible, complex plant. We know so little about the potential benefits and therapeutic uses of cannabis—it’s so exciting to think about the possibilities that can reveal themselves once we’re able to do more research and testing. Personally, I am a low-dose kinda gal. Cannabis helps me relax, or get a good night’s sleep when I need it. I think a lot of people have been scared off edibles because they’ve overdone it in the past—we’ve all been there! A little can go a long way, and can be just what you need to shift your perspective. Coreen: I’m a firm believer in cannabis as an overall wellness product, and I’ve used cannabis daily through a variety of methods for many years. I prefer the old classic joint over all other consumption methods, but I usually have two to three vape pens in my purse at any given time. I take CBD, THCA, and other non-psychoactive cannabinoids in the form drops and honeys for various ailments…and, of course, plenty of edibles as well. How do you feel about cannabis being more mainstream now? Stephanie: Public perception of cannabis has definitely reached a tipping point, and I am all for it. One of the guiding missions for my business and for the cookbook is to destigmatize and normalize cannabis. We want people to have a delightful cannabis experience that isn’t scary or taboo. We want to educate people about what cannabis is, and how they can incorporate it into their lives. Coreen: Overall, I feel it’s a great thing, but I just hope that the culture and community that started the movement is preserved as we move toward further normalization. It’s common sense in my eyes. Cannabis and hemp are amazing and can truly help make our lives more sustainable, healthier, and happy. When did you start cooking with THC? Stephanie: I started Mellows in 2015. That’s when I really zeroed in on cooking with cannabis in a precise way. Coreen: I’ve experimented with it on a personal level since college, but I started professionally in 2013 and have been doing it full-time ever since. Stephanie: We wanted to create a beautiful cookbook that showcased how delicious edibles can be. Once you’ve mastered how to make cannabis infusions, the sky's the limit on what you can do with it. As professional chefs who love to entertain, Coreen and I wanted the recipes to reflect how we love to cook—and eat. It’s a special collection of our tried-and-true dishes. We also wanted to make it approachable for people who may be new to edibles, so we formulated the recipes to be low-dose servings. Coreen: Oh, so many things. The cannabis community, the need for de-stigmatizing, the health benefit, the education of it all. This book truly combined everything Stephanie and I have learned over the past five years and cumulated it into an easy to follow and fun format. What are some tips for someone cooking edible cannabis for the first time? Stephanie: We highlight a number of tips and tricks, but there are a few important ones. First off, use a scale: we prefer using scales in general when it comes to cooking and following a recipe, but especially in this case, precision is important when you’re working with an ingredient like cannabis. Second, get a rubber spatula: this is a super versatile and useful tool. When you have to scrape down the sides of a mixer bowl, or when you’re transferring a medicated batter or melted chocolate from one vessel to another, it is the best tool to make sure you’re getting every last bit, which is important to ensure your dosage is on point. Third: If you’re gifting your edibles, or serving them at a party, make sure they are clearly labeled and make sure all your guests are educated on what to expect. What is the secret to a good cannabis dish? Coreen: That it tastes good and makes you feel great. Too much of a cannabis infusion can leave a bitter taste and potentially get you too high. The secret is that you feel great once those effects kick in. So start low, go slow. What are your favorite recipes from the book and why? Stephanie: The Superfood Truffles are super fun to make, and I love how versatile they are. You can change up the toppings or the spices however you’d like and really make it your own. They make a lovely gift. I also adore the Grapefruit Negroni “Pot” de Fruit. They are a twist on classic French fruit jelly candies. They have a vibrant pop of flavor to them and they are just so pretty; they look like brilliant little jewels. Coreen: My favorite is the Five Spice Duck Meatball Slider with plum chutney and herb aioli. It’s always a crowd favorite whenever I serve it. This recipe is from my catering days: I would serve a mini version of the meatball with the plum chutney. They were the first to go at any party!